If you are like me, sometimes you just need to say to yourself, “Well done, Jon!” Now, give yourself a little round of applause, because sometimes you and I, we get things right as well. Last Friday, we talked about what I got wrong. I encouraged you to write down the things you got wrong, how you can improve and how you can acknowledge that sometimes we just get things wrong. It’s all part of the learning curve. But, did you know that if you improve and learn you are going to get things right. Hopefully you get things right quite often. What I am going to encourage you to do is to think about congratulating yourself. So Jon, what did you get right this week? 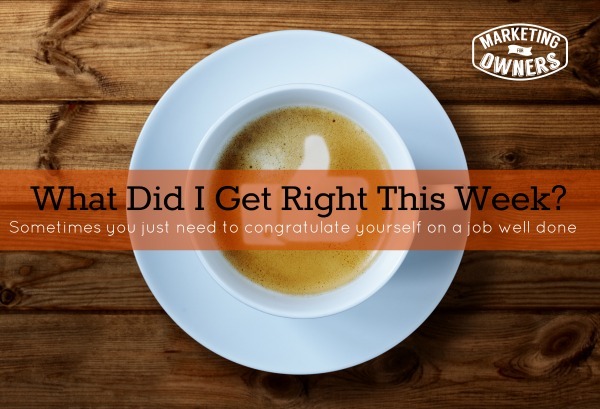 Let me tell you how my week was and what I discovered. Let’s start with this podcast that I do. For me, I have a lot to do and a very small team. While we are small, we work very efficiently to produce a lot of content and do a lot of work. Now I used to do quite a bit with the podcasting from start to finish, but now my fantastic assistant, Jennifer takes over everything to do with the podcast other than me doing the recording portion. Once I record it, I upload it to Dropbox, and that is the end of my involvement. All I have to do is come up with a subject, record the teaching and then upload it to Dropbox. Jennifer and Harvey do everything else to get these podcasts ready for publishing. Jennifer showed an interest in what I was doing, so I took her aside, gave her a bit of training and delegated the podcast task to her and she handles that for me. In my fire protection business, we just opened up two new channels in our marketing. One is a catalog that we are working on printing. We used to have one a few years ago, but it took quite a lot of effort with editing and keeping it up to date. We decided to update it and instead of doing it ourselves, it has now been sent out to a designer, brought back in and it has been passed to Jake, one of my staff, who has been trained on how I want it done and he will be handling that. We have worked through it as a project management team. He has taken it over and he is doing a fantastic job. He completely gets it and understands that is quite important. He understands the “why”. Remember we talked about that. He understands what it is going to do, how it contributes to the business. So he now is looking after that. These will be going out and they will be redesigned and reprinted every three months. My involvement, if anything, will be very little. We have had some videos in the fire protection business, but not enough. We want to do a steady wave of producing them efficiently and easily. We produce a lot of marketing material with a very small team. In fact, when I say team, most of them are outsourced. So we started producing videos. It has been delegated to Jake as he enjoys editing video. All I do is turn up, sit down, record the video and Jake sets up the lighting. We have a new in house studio and the lighting cost hardly anything. It was so easy to set up. We record the videos in a simple format. He has figured out how to edit them in a style that works for us, gets them up on YouTube, and then gets them up on the website. W are producing around three to five every single week. My involvement is roughly half an hour to forty minutes total. It helps to have good staff by the way. Another company I have, which is a body sugaring company, Alexander Professional, needed to have some specific reports ran. My partner, Carolyn, found someone to produce this report. We wanted a report that had been written and edited, but we were unhappy with the design and neither of us had the time to figure it out. Carolyn stumbled across someone, spoke to that person about what we were looking for and then let her do her job. She has produced a fantastic report at a bargain price. It is so impressive, that we didn’t have to have any edits. We were so impressed with her work, that I have already given her the next project, and another one and have already had another friend in Canada, that is going to hire her to do their reports as well. It is great to find somebody that you can trust to give a job to, who gets its, does a fantastic job and you can leave it to them and pay the bill at the end. So that is what I did. 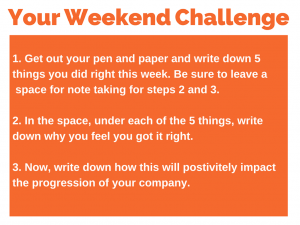 I’ve just patted myself on the back for a job well done, and now your weekend challenge is going to be to do the same. 1. 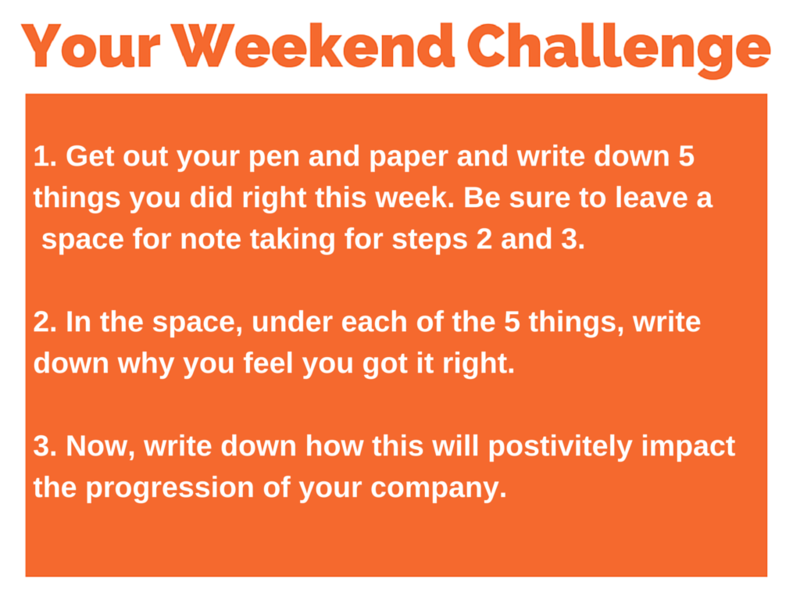 Get your pen and paper and write down 5 things that you did right and did well this week. They can be something so strange as getting one of your members of staff to do something for you that then works out well. That means that you’ve delegated it efficiently and effectively. 2. Once you have written those down, go back and write underneath each one, why that was good and the result it will give your company. 3. Write down how this will help you to positively move forward in your company. How does it enable your company to move forward, and for that project to progress. It is good getting it done and it is good congratulating yourself, but even better, when you can realize what part that plays in the bigger picture. So — what did you get right this weekend?